Books about running rarely take on a literary cast, but Poverty Creek Journal does by stepping past the memoir, the how-to, and fiction to find room to introspect along the run. 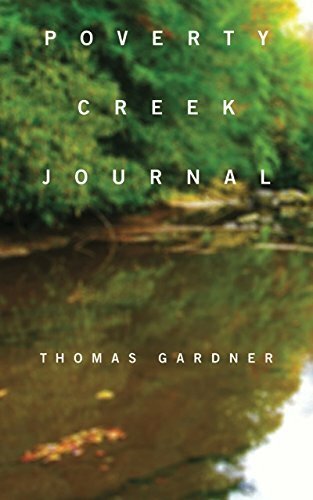 Set forth in short vignettes, Thomas Gardner explores the nature of both his environment and his running through a perceptive lens. The last part is an allusion to Whitman’s Song of Myself. Gardner, a Professor of Literature at Virginia Tech, sprinkles his work liberally with the wisdom of the poet brought to the act of running. The mix is intriguing and provocative. Whitman gets a share of attention, and Dickinson, and Thoreau, Frost, Melville. Picture please, George Sheehan finishing a run and finding Henry Thoreau waiting. The two would sit and converse, compare points, probably long into night. If one or the other were to write a volume of that conversation, it would resemble Poverty Creek Journal. The words written within its pages are less about the run itself than the essence of running. For Thomas Gardner, the path to the truth of the run lay outside the books on mechanics and pacing, or the truths in John Parker’s (or my) fiction, hidden in plain view if one knew where to look—and dared to.